Quiz time! What type of customer will pay four times more than other customers? Give up? OK, we’ll tell you: consumers connected with a multi-channel approach. To get the most bang for your digital marketing buck, integrate display, mobile, social and video marketing into your marketing strategy. Check out the below infographic by Digital Marketing Philippines for more tips on improving your digital marketing results. Last Fourth of July we taught you how to grill a mouthwatering steak to perfection and threw in some marketing lessons too. Why stop there when there are so many great lessons learned from this land-of-the-free celebration? This time we're talking about the main event: the fireworks show. By following these simple steps, your marketing campaign is sure to light up the sky. There's a lot more to fireworks shows than crackling lights and pretty skies. 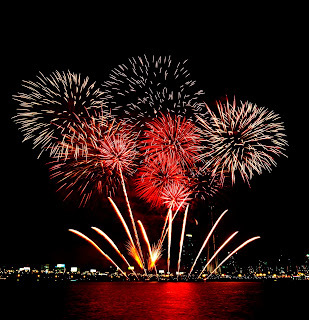 Shows must be strategically planned, from the fuse alignment to the variation of fireworks. No one wants to send off all their Willows and Chrysanthemums at the same time! The same planning strategies apply to marketing. Sit down and organize your campaign from beginning to end. This approach allows you to continually build on each campaign and guarantees that your main campaigns launch at the right times. Whether you're spending $150 or $15,000 on fireworks, you want every single one of them seen and appreciated without boring your viewers. Lighting them off in increments allows viewers to beg for more and keeps their full attention. What better goal for a marketing campaign? Marketers should focus on grabbing prospects' attention and keeping it for the rest of the show, er… campaign. By utilizing social media, mobile and email marketing, you can market products at different times using a variety of resources. Zizzzz-phhht! POW! Have you ever noticed the whimper fireworks give off as they rise and explode into something beautiful? That’s the sound a rockin' marketing campaign makes. The work leading up to a release can be exhausting and feel unrewarding, but when you catch yourself feeling like your campaign is off to a slow start, keep going and wait for your time to shine. The grand finale to your campaign is like the end of a fireworks show. Everyone will talk about it, and they'll have high expectations for the next one. These last impressions are important and will leave your customer satisfied and smiling. Looking for more activities to enjoy this summer? Brush up your golf skills while you learn how to hit a hole in one with your marketing.